Setting out from Colmar at 9.30, we stopped for toilet, petrol and a bite to eat, consisting of leftover baguette from breakfast and some fruit we had. A good run meant we arrived in Lyon at about 2.30pm. Ensconced in another friend’s apartment, this time it was in the centre of town, and though only a studio, the high ceilings with exposed timber beams, crepey textured walls and very modern lighting with a remote control, meant we were quite comfortable. And because it was in a solid stone building it meant it gave us a little reprieve from the steamy heat. Augustinerbrau Miinthen Lagerbier Hell – light-coloured drink with a few bubbles. A very light beer with a slightly yeasty taste. Export 33 – a French beer in the style of a Cerveza in 250ml hand grenades. Very easy to drink, and therefore dangerous. Paulaner Weifsbier Kristallklar – another light German beer with a head that disappeared quickly. A flavour of mixed herbs thus not one of my favourites. Paulander Hefe-Weifsbier Naturtrub – a cloudy version of the beer above. A slightly thicker texture – prefer others. 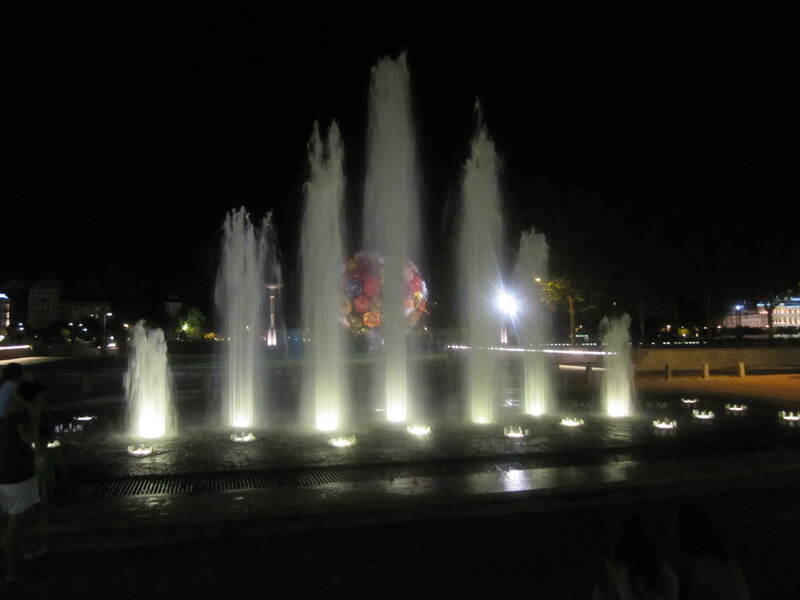 We walked down past Place Bellecour to the central malls and dining area. 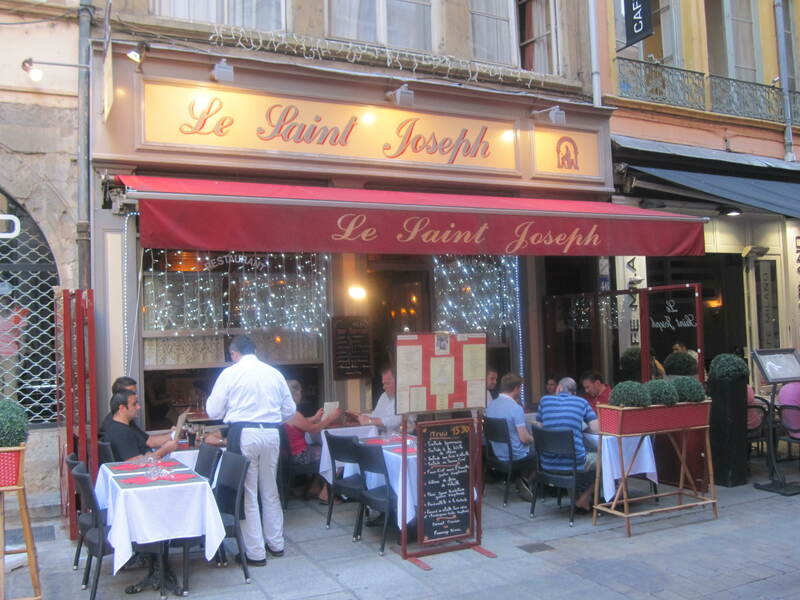 We continued on to dinner, settling on Le St Joseph, with its €15.90 three course meal. We ate inside, mainly because at least there was some cooling, and a lovely decor with walls that were painted to look like marble, and a Renaissance feel. I loved the Salade Lyonnaise as a starter, which was a green salad with a poached egg, bacon and croutons. Then I enjoyed Magret de canard au poivre avec Gratin Dauphinoise. This was duck with a pepper sauce and cheesy scalloped potatoes, finishing off with Dessert Maison, mousse au chocolat in my case. The meal was accompanied by a Belleruche Côtes-du-Rhône 2009 red, which was over-priced for the quality. On the way back we took some nice photos of Lyon at night, before arranging to meet at midday the next day. Apparently Starbuck’s is fairly new in France, and there are two in Lyon, one with free wi-fi with purchase, and the other that you have to pay for. Naturally we selected the former, though it was a ten-minute walk further on. We had breakfast with a good cappuccino, and utilised the internet on Dutchy’s itouch. We had been unable to access hotmail and facebook for some time, and doing the blog was impossible at this stage. If anyone wonders why some of my blog posts are so huge, that’s why. I might be able to type on my laptop, but not be able to post. Finally we saw Hanis again, after his illness of Dengue fever, from a mosquito bite in Asia. We met back at the apartment, which was fortunately easier to find than some of the other locations we have stayed at. 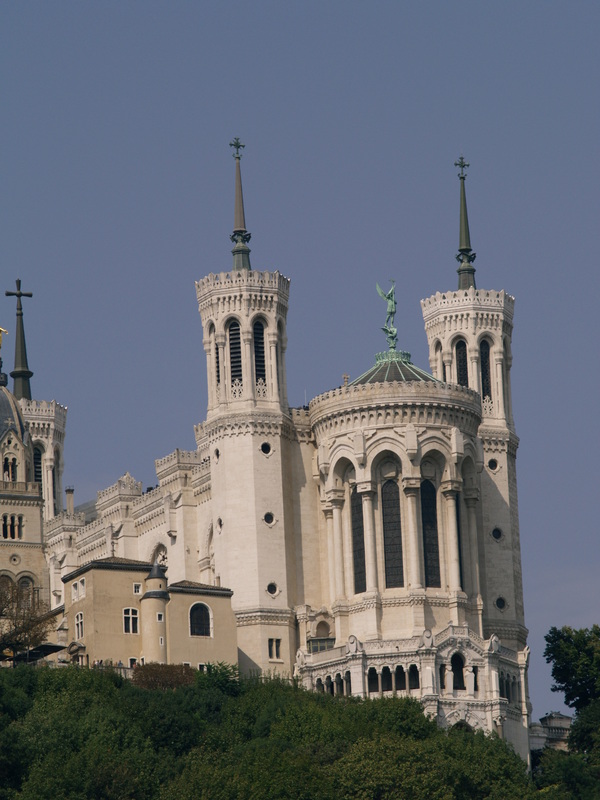 After lunch at Le Gourmand de St Jean, we set off up the long hill to Fourvière, a Church on the top of the hill, and a landmark of Lyon. 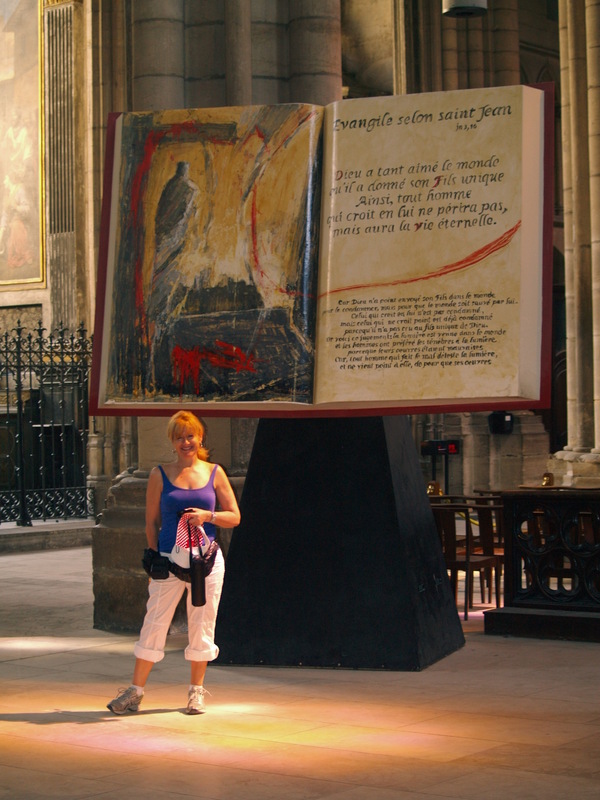 Similar to going up to Montmartre in Paris, the inside of this church was really old and ornate inside. On our way back down, we passed through the ancient arenas of Vieux Lyon (the old Lyon), and then the weather changed and rain threatened, so we ended up taking the funiculaire, a tramway run on cable. Visiting a pub, there was a television on with football. Of course, when you are in France, the word football always refers to soccer, unlike in Victoria, Australia, where it is understood to be Australian Rules Football. Dutchy’s beeralogue is not present for this entry as he drank beers he had already tasted. That evening Hanis took us to a friend’s large apartment for dinner, where we sampled some Algerian food. Because it was Ramadan, it meant they weren’t supposed to eat until sunset, so it was a fairly late start. Then, because both Yacine and El Khansa had to work the next day, we didn’t stay too late. As you might imagine, due to a certain beeralogue, there have been consequences. Usually Dutchy doesn’t drink beer, as he knows it is not good for one’s tummy profile, and besides, he rather enjoys his Bourbon. 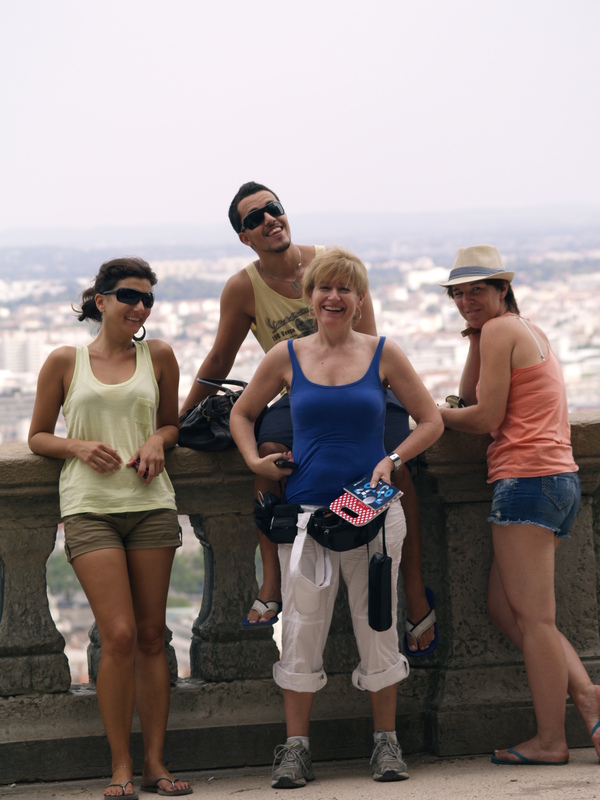 While we were up at Fourvière, I was going to subtly remind him to hold his stomach in (good posture doesn’t lose weight but can hide kilos or pounds), but the tourist booklet I was holding accidentally hit him a bit hard. The others found this rather amusing, accusing me then of killing his “beer baby” which then became a standing joke in the group. As with those sort of incidents, they lose something in the retelling, but I include it for my own amusement. This entry was posted in Uncategorized and tagged food, funiculaire, Lyon. Bookmark the permalink.